The head of a dreamer is a crowded place, but it can also be a lonely one. Twardzik says she did not "come out of her shell" until she spent a couple years at The University of Akron. "I remember my freshman year I would be really timid and scared to go places, and to talk to people," she says. 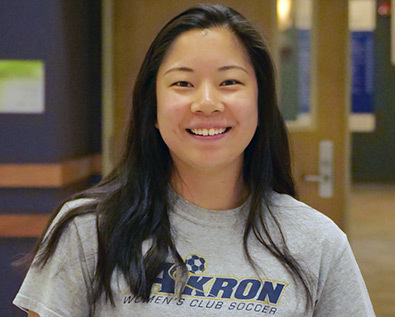 The quiet girl 2014 Garfield graduate, now a senior, has since become a double major (marketing and integrated marketing communications) on the dean's list, a member on the women's club soccer team and a marketing intern at a local plastics manufacturer. Twardzik credits the friendly and welcoming "community atmosphere" of the university for helping her break out of that shell, as well as the range of academic opportunities available to her. "You can try new things here," she says. "If you want to join that club, you can join it. If you want to try out for that job or internship, you can do it. You really find out who you are at UA." Twardzik's studies in marketing have enabled her to find out who others are, as well - something she may continue to do after graduation, as she is considering pursuing a degree in psychology. Her myriad dreams, once coiled up in her head, are - like the calligraphic letters she paints in her spare time - spilling out into a beautiful reality with the help of professors and advisors at UA. "They are really good at helping students try to network, improve their resumes, dress professionally and go to career fairs," Twardzik says. "The professors push you, because they want you to succeed. They're really good at being supportive and trying to open doors for students." "Never be afraid to try new things," she says, repeating the counsel she recently gave one of LeBron James Family Foundation's I Promise students at a mentoring session, in which student ambassadors from UA met with Akron Public Schools students in the LeBron James Family Foundation program. What is the next "new thing" Twardzik is adding to the list of astronomer, veterinarian, interior designer, marine biologist, marketing expert and psychologist? "I really want to handle the marketing for Disney World," she says, adding that she "really is a kid at heart." Indeed, Twardzik would say it is because she has remained a "kid at heart," open to endless possibilities, that she has grown up to be a successful, confident woman. Congratulations to Emma, and thank you for making James A. Garfield so proud!